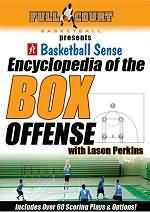 This article is the fourth in a series of four articles on basketball's Box-set offense and coach Lason Perkins' excellent DVD on the Box offense. Coach Perkins at this writing resides in Cary, NC and coaches basketball at Carey Academy. Lason Perkins is recognized globally as one of basketball's brightest coaching minds. He has coached at every level of basketball from elementary school to the professional ranks, and is the creator of many instructional basketball videos. He is a great student of the game with an expert understanding of Xs and Os, and maintains contact with coaches from around the world. 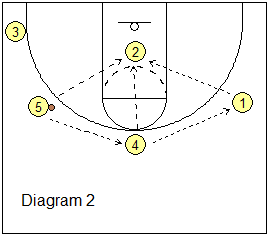 The back-door plays are designed for attacking pressure, over-playing denial defenses with a back-door cut and lay-up. The ISO plays give your great 1-on-1 player opportunities for attacking his/her defender 1-on-1. 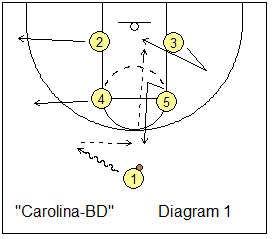 Dean Smith used this simple play at North Carolina. 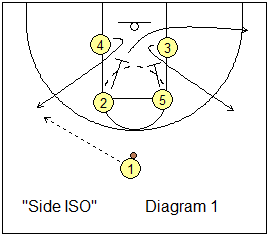 Starting with the box set (diagram 1), O1 dribbles left, as O2 and O4 cut out the left corner and wing. O5 cuts to the top and gets the pass from O1. 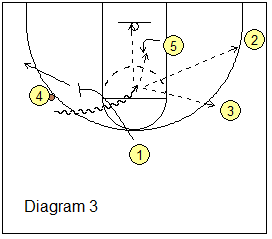 O3 starts a cut out to the right wing, but then quickly back-cuts to the hoop for the pass from O5. 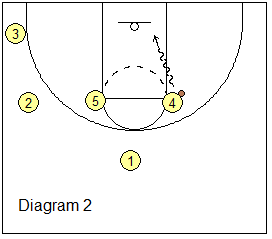 This works well against teams that aggressively deny O3 (your leading scorer). 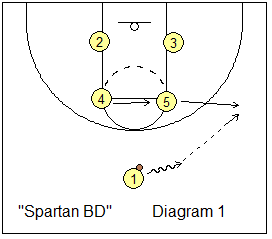 Tom Izzo has used this play at Michigan State. Starting in the box-set, O5 cuts out to the right wing for the pass from O1. O4 moves over to the right elbow. Using O4 as a "scissors" screener (diagram 2), O3 cuts to the top as O1 cuts inside to the right block. 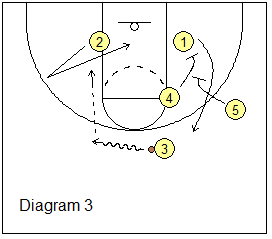 O1 could receive a pass here for a lay-up. Otherwise O5 passes to O3 at the top. O3 dribbles left. 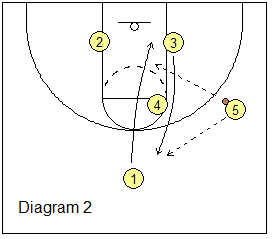 O2 starts a cut out to the left wing, but suddenly back-cuts to the hoop for the pass from O3 and the lay-up. On the opposite side, mainly for the purpose of occupying the helpside defenders, we have O4 and O5 set a staggered screen for O1, and O1 cuts to the top. 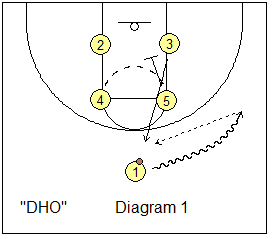 O1 dribbles to the right wing (diagram 1), as O5 down-screens for O3 and O3 cuts to the top for the pass from O1. O4 down-screens for O2 and O2 cuts to the left wing, as O5 cuts out to the left corner. 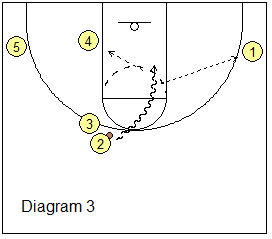 O3 dribbles toward O2 for the weave-screen, dribble hand-off (diagram 3). 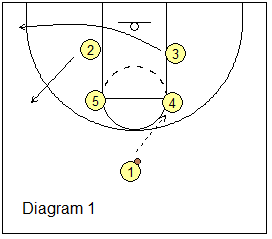 O2 attacks with the dribble-drive, and has passing options to O4 and O1. From the box-set (diagram 1), O5 and O2 down-screen for O3 and O4. O3 cuts out to the right wing. After screening, O2 moves to the right corner, and O5 goes to the right block. O4 cuts to the left wing for the pass from O1. We now have a nice clear-out situation for O4 (diagram 2). 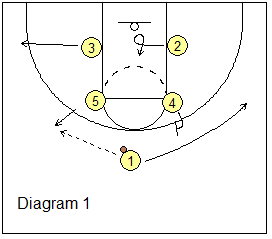 O4 is a strong 1-on-1 player and attacks his/her defender 1-on-1. If O4 does not immediately attack the defender, O1 sets a ball-screen for O4, who then attacks with the dribble to the elbow (diagram 3). O1 moves to left wing-corner area. O4 looks to score, or pass to O2, O3 or O5. 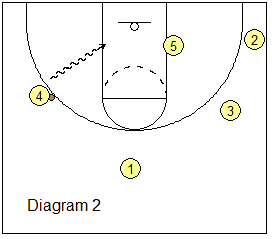 This is a simple isolation, clear-out play for your talented O4 who can score. From the box-set (diagram 1), O3 cuts over to the left corner and O2 cuts out to the left wing. O1 passes to O4 (diagram 2) at the right elbow. O4 has a 1-on-1 situation and attacks to score. 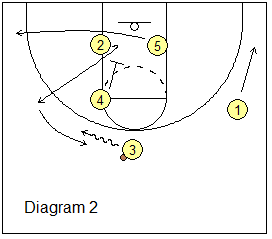 With this play, we will try to get the ball inside to O2 posting up (perhaps vs a smaller defender). Starting in the box set (diagram 1), O5 pops out to the arc and gets the initial pass from O1. O3 moves out to the left corner. O4 sets soft flare-screen for O1, and O1 cuts to the right wing. Meanwhile, O2 moves inside and posts up (diagram 2) for a pass from either O5, a hi-lo pass from O4, or a pass from O1. Get more Box-Set Plays in the Premium Members section and the Playbook download. It also includes "Curl ISO" and "Misdirection".